Then she could write stacks of paper taller than towers. she ran around in circles until she was dizzy. and that is how she came across her favorite mound. Writing Workshop will focus on poetry for the next two weeks. We began working with free verse poems. Students listed topics they were interested in developing. Next, they picked one and worked on a "So What?" This is based on Nancie Atwell's Lessons That Change Writers. Atwell talks about the importance of knowing, "Why are you writing that," and, "what is the point?" 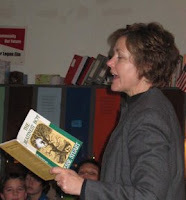 She wants writers to think about the lesson, meaning, and/or moral. Mrs. Bower, the Educational Specialist that is in each day during Writing Workshop to help students, taught about how to write a Clerihew poem. This type of poetry has four lines and is often written about a person. The first two lines rhyme and the last two lines rhyme. The poem is meant to be funny, so after a week of gray days the students enjoyed the "comic relief" that writing them brought. That'll be a sad time when he bids us "Good Bye"
I'm so sure all the cute girls will cry! Mrs. Bower shared this example for all of the students (and they thought this was soooo funny). 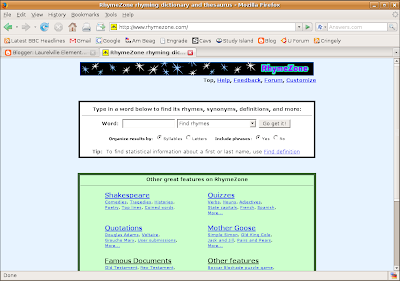 One of the tools we used to help find rhyming words was the website www.rhymezone.com. This website makes it much easier when students choose to write poems that rhyme. Check back to see some of the best student work! The Laurelville Reading Board is back up, and ready for comments. This is a place where you can comment about books. I have started out with a few of our favorite books, and our favorite series. I will be adding more topics/titles soon. When you finish a book, jump in and comment. BUT, don't give away the ending, or spoil the story for someone else. To comment go to our Reading Board. This is one of the books that is listed for comments. I know this is one of many sixth grader's favorites, so tell us what you think.